CHICAGO, IL (February 19, 2015): After entering Chicago in 2014, David Weekley Homes is now building exceptional homes in Glen Ellyn, Naperville, Wheaton, Downers Grove and Elmhurst! The home builder is building custom homes in these areas, including two that are ready for immediate move in: The Renward, priced at $814,990, and The Billingsgate, priced at $799,990. The Renward and The Billingsgate each offer four bedrooms, three full baths, one half bath and a two-car garage on two levels. Located at 1317 North Eagle Street in commuter-friendly Naperville, The Renward boasts more than 3,400 square feet of living space, and features a covered porch, study, keeping room, formal dining area and mud room on the first floor. Nearby is the Naperville Riverwalk with a variety of family-friendly and upscale dining, and plenty of boutique shopping for almost any budget. 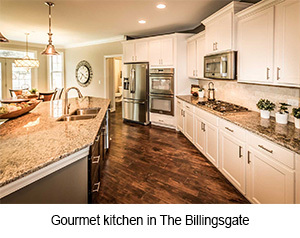 The Billingsgate is located at 328 Maple Street in Glen Ellyn and is more than 2,800 square feet. The home includes a spacious dining area and gourmet kitchen that opens to the breakfast area, and a second level Owner’s Retreat. Glen Ellyn is 23 miles from Chicago and is home to the Glen Ellyn Park District, an array of fine dining choices, and great shopping at Yorktown Center and Oakbrook Center.